One of the most rewarding aspects of my baking life in India is being able to experiment with exotic fruit without having to take out a second mortgage. At home in Scotland, mangoes, lychees, papayas are the foie gras of the fruit world, flown halfway round the globe to be nibbled and savoured. Many of these fruits I had never seen in abundance until I came to India. The voluptuous bunches of pink lychees in the Delhi markets are a far cry from the hard brown balls we used to find in our Christmas stockings. In the summer, as well as gorging on mangoes I’ve popped them into muffins. Until recently, I thought the only purpose of cape gooseberries was to pep up lacklustre fruit salads. I now discover their citrusy softness is perfect in cakes, tarts and puddings. 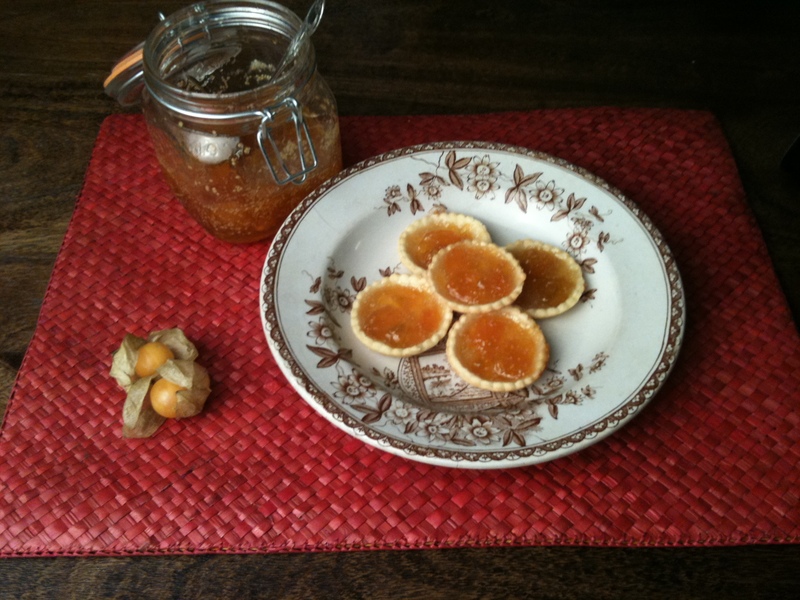 In Scotland, where we tend to buy cape gooseberries by the handful rather than kilo, jam is one of the fruit’s most glorious incarnations, fabulous on toast but positively addictive in these jam tarts. I’ve sneaked some ground almonds and sugar into the pastry, taking them from packed lunch standby to dinner party diva. 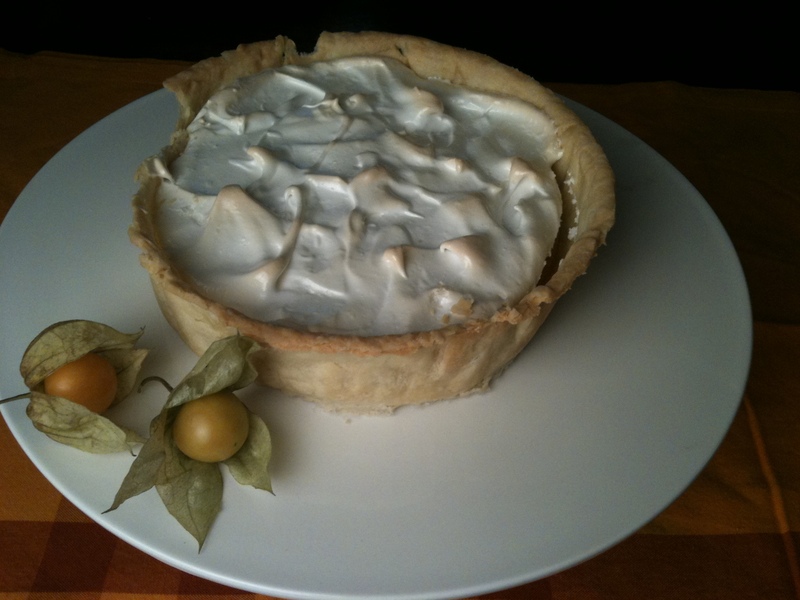 Cape gooseberries also make for an unusual, delicious curd, which, on a whim, I made into a meringue pie. It involves a few extra steps but the soothing texture, knockout flavour and vibrant, sunshine colour make it more than worth the effort. Put a couple of clean saucers in the fridge or freezer. Prick each fruit with a pin once, then place in the heaviest-bottomed pan you own (it’s very easy to burn this jam). Add a splash of water, put on the lid and place over medium heat for about 5 minutes until the berries are soft. Add the sugar and stir to dissolve. Increase heat and bring to a boil. Boil, stirring regularly, for 5 minutes. Lower heat. Put a small teaspoonful of the jam on a cold saucer. When the jam has reached setting point, it will wrinkle slightly when pushed. If it doesn’t, boil for a couple of minutes. Keep an eye on the jam, stirring regularly to prevent sticking or burning. How long it takes can vary between batches of fruit. One batch took me 3 minutes, another 35. When the jam is ready, pour into clean, warm jars. This jam will only keep for about a week in the fridge. You will need a 12-hole tart tin and a 3-inch pastry cutter. Sift the flour into a bowl then grate in the butter. With a palette knife, gently stir in the butter until all the strands are coated with flour. Stir in the almonds and sugar. In a cup gently beat the egg yolk, orange flower water and a tablespoon of water. Quickly add most of the liquid to the flour mixture. Stir until it starts to come together, adding a little more of the liquid if necessary. The pastry should form into a firm but not wet ball. Cover with cling film and chill for 30 minutes. Heat the oven to 200 degrees Celsius. Flour a clean work surface then roll the pastry out thinly. Cut out 12 circles and gently press them into the tart tin. Put one teaspoon of jam in each tart and bake for about 10 minutes or until the pastry is starting to turn a pale brown (for detailed tips on baking pastries, log on to www.livemint.com/applepie.htm). Cook the berries with the lemon zest and 50ml water until they’re very soft, then push them through a fine sieve. Put the purée in a heatproof bowl with the butter, sugar and lemon juice over a pan of simmering water. When the butter has melted, whisk in the eggs. Keep stirring until the curd thickly coats the back of a spoon. Again the time can vary, but it took me about 30 minutes. Pour the curd into a clean jar and seal. Once opened, use within a month. For a cape gooseberry meringue pie: With pastry made from 100g flour and 50g butter, line an 8-inch, loose-bottomed cake tin. Bake the pastry shell, empty (“blind”) for about 15 minutes. Spread curd over the bottom of the pastry case and top with meringue made from 2 large egg whites whisked with 80g caster sugar until firm enough to hold the bowl upside down. Bake at 150 degrees Celsius until the meringue is pale brown. To see step-by-step slideshows for these recipes, click here to get to the Mint Lounge website. Hopped over to your blog while random surfing! Totally love it! Adding you to my reader. What a pity we don’t get these little fruits in Pakistan. While on the subject of fruit, can I ask if you have a good marmalade recipe you may wish to share?????? 🙂 I make jam a lot but am going to try marmalade for the first time, before the wonderful orange season comes to an end. I have found lots of recipes, new and old-fashioned but they offer a dizzying variety of techniques and I have no idea what to go for. Soak the fruit and use it all or use the versions with juice and rind but no pulp and so on and so forth! This is a little something I must find more information about, appreciate the article. Thats exactly what I miss about India. The ginormous abundance of fruit & veg which doesnt need to be flown in all they from another country travelling 20 hrs or something! When in season I adore gooseberry fool; tho I have to try the tart its sounds divine. Dear Pamela, love your articles in Mint and now a regular visitor to your web site esp. since you are now cooking more with Indian ingredients. With your experience, it will be great if you can recommend an OTG (Oven/Toaster/Grill, that is). I intend to buy this so I can cook more healthy this year — baking chicken, grill fish etc. Thanks in advance, for your advice. Hi Sean – sorry for the delay. I’ve used all sorts of OTGs since I’ve been in Delhi. I think on balance I prefer the Morphy Richards – I have the big one at the moment and it’s big enough to roast turkey! I also have a little Bajaj which has proved to be perfect for making macaroons. Hi Amber – sorry for the delay in replying – I’ve had a lot on my plate recently. Actually I’ve never made marmalade. I recommend you look up the British baker Dan Lepard who writes a column in the Guardian – he’s been doing a lot on marmalade recently. I Love your blog but please can you give us recipes for a really good korma and birihani. Thanks. Gooseberry Jam… Reminded me of my childhood days.. Mom used to make them in huge batch’s and we used to enjoy it on everything.. Bread, rotis, parathas, puris.. I used to eat it just plain. Wonder where I can buy this from now in Mumbai.